There are currently nine different Jet band saw models designed for woodworking, ranging from a 10" portable bandsaw to a big 20" 5 HP model. Here we will talk about the larger 16", 18", and 20" bandsaws. For information on their 10" and 14" models, see our other Jet Bandsaw page. Jet Tools is part of The Walter-Meier Holdings group, which also produces Powermatic and Wilton tools. Jet Tools began business in 1958, and expanded into woodworking tools in the early 1980s. Their tools and equipment have always been designed with the professional or serious hobbyist in mind. The current lineup of Jet bandsaws is no exception. The five different Jet band saw models we will talk about here are all part of the same "family" of vertical band saws, and all use Jet's "Triangular Stability Control" (TSC). They have a triangular-shaped column instead of the usual rectangular column that most (if not all) other vertical band saws have. The triangle shape gives you 65% less twist and rotation under heavy loads. Less twist means cleaner, more accurate cuts. All of these Jet bandsaws have cast iron tables that tilt from 10 degrees left to 45 degrees right, and all will handle up to a 1-1/2" blade. They each have the rack and pinion blade guide adjustment mechanism and cast-iron handwheels. First up is the "little brother" of the family, the 16" JWBS-16B. This Jet band saw uses a 1-1/2 HP motor that comes prewired for 115V but can be converted to 230V. It has a 16-3/8" rip capacity, and a 10" resaw capacity. The cast iron table measures 17" x 17", and the saw has adjustable European-style carbide blade guides. It also has an adjustable rear base support that can be extended for added stability. The newest line of Jet band saws with TSC has only been out for a couple of years, so there aren't a ton of reviews for them. The current model JWBS-16B gets 3.3 out of 5 stars on Amazon.com, but there are only six reviews (click to see them) , and one bad one brings the average down. The previous model of 16" Jet bandsaw gets 4.3/5 stars on Amazon with 17 total reviews. One common complaint is that the blade that comes with the bandsaw is junk, but that seems to be a somewhat universal complaint no matter what brand, size, or type of saw you are looking at. Do yourself a favor and get a couple of good Woodslicer or Timberwolf blades, and just keep the original blade as a spare. Problem solved! Another owner received one with a bent cover that was in contact with the motor's fan. He also had difficulty getting the optional fence from Jet, but that can be remedied by purchasing an aftermarket fence. He was happy with his purchase except for the fence availability issue. One Amazon reviewer reported a motor failure, but I suspect he actually has an older machine. This model just came out in 2008, and when he reported the failure in 2011 the motor would have been covered under the 5-year warranty if he had the current model. Finally, the one guy that was unhappy said the blade guides would not hold their adjustment, and the fence was flimsy and fell apart. No one else I found reported these issues on this model, and they don't show up in reviews of the previous model either. Outside of Amazon, the reviews are pretty good. There is a 4 star review on the Rockler website. ToolSeeker has two 5-star reviews of the previous model, and LumberJocks has a positive review of the previous version also. Overall, if the 16" Jet band saw meets your needs, I think it is a solid choice. Compared to a 14" woodworking band saw with a riser block, it will be more stable, have more power, and be more accurate. Remember that only 6 reviews (on Amazon) out of what is surely hundreds sold is not necessarily a representative example, and people with negative experiences are more likely to post online than people that are satisfied with their purchase. Note: If you are buying your first bandsaw, or need help tuning up one you already have, I recommend getting a copy of either (or both!) Lonnie Bird's The Bandsaw Book or Mark Duginske's The New Complete Guide to the Band Saw . Either of these books will help you understand the features and capabilities of a band saw, and guide you through making adjustments, choosing the right types of blades, maintaining your saw, and tell you what to do when things go wrong. Both have excellent ratings on Amazon, and are recommended by lots of folks in the woodworking forums. Next up are the 18" Jet band saws, the JWBS-18QT and the JWBS-18QT-3. These wood band saws are identical except for the motor. The "regular" 18QT comes with a 1-3/4 HP, 115/230V motor, and the 18QT-3 comes with a 3 HP, 230V motor. These models have a quick-release blade tensioning lever, which is a big plus. They also have toolless micro-adjustable ball bearing blade guides, and come with a fence and a miter gauge that are extra-cost options on many other wood band saws. The 18" Jet bandsaws use a poly-V drive belt for less slippage and smoother operation, and also have 2-speed pulleys. I was unable to find any owner reviews of the current 1-3/4 HP 18" Jet bandsaw , but the previous version averaged 3.9 out of 5 stars on Amazon with 16 reviews. LumberJocks also has 2 reviews of the previous model, a 3-star and a 4 star. The 3-star reviewer overworked the motor and had to replace it, and the 4-star reviewer was happy with the saw overall. If you plan on doing much resawing near the 12" capacity and have access to 230V power, go with the 3HP version. It is not much more expensive, and gives you a lot more power. There are three reviews of the JWBS-18QT-3 on Amazon , and they average 4.7 out of 5 stars. Amazon has an additional review listed under the 18QT-3 bandsaw, but that purchaser actually has the older version of the 1-3/4 HP model - you have to pay attention when reading Amazon reviews! Additionally, Woodcraft has two reviews of the JWBS-18QT-3, a 2-star and a 4-star. Neither of those folks were happy with the fence, but many people who use a bandsaw fence on a regular basis will opt for a high-quality aftermarket fence anyway. Finally, we get to the "big boys", the 20" Jet band saw model JWBS-20QT-3 and the JWBS-20QT-5. These have all the same features as the 18" bandsaws above, plus a foot brake to stop the blade quickly when needed. They both have a 21" x 21" table, with a 20" rip capacity and a 12-1/4" resaw capacity. Both of these wood band saws require a 230V circuit, and the motors are rated at 3 HP (JWBS-20QT-3 ) or 5 HP (JWBS-20QT-5 ). Reviews of the 20" bandsaws are few and far between. The only one I could find is on Amazon, where a lady purchased one for her husband, and he told her it does what it is supposed to do (apparently a man of few words!). A lack of reviews could be looked at as a good thing - that means no one is complaining about it online! Overall, most Jet band saw owners are happy with their purchase. Sure, it would be great to find a woodworking band saw with dozens of 5-star reviews where no one has a complaint, but that just doesn't happen in the real world of mass-produced woodworking tools. The Jet tools "...do what they are supposed to do" for the most part, and their ratings are in line with most other similar-sized vertical band saws. No woodworking band saw is perfect, and the current crop of Jet band saw models are as good as almost anything else out there in the same price range. If you are looking for a bargain on a big bandsaw, take a look at the 17" Grizzly lineup. They get really good reviews and are value-priced. You can get more detailed specs for the Jet band saws at JetTools.com. 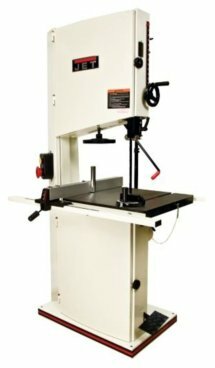 Looking for a smaller woodworking band saw? Take a look at our pages on the 14" Grizzly bandsaws and the 10" and 14" Jet Band Saws.